Simply Dynamo: What is Dynamo? I have been asking myself this question for months now and it is a very difficult question to answer simply because Dynamo does SO much. Below is my answer to this question and I hope it clarifies it for some of you. 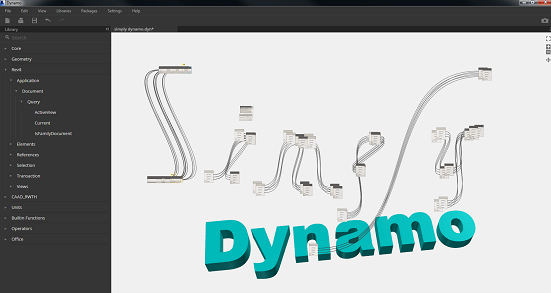 Dynamo is a free program from Autodesk that uses visual programming. Dynamo primarily does two tasks. 1. Creates its own geometry with parametric relationships. 2. Reads and writes to and from external databases. Since Dynamo creates its own geometry and reads and writes to external databases it is a perfect fit to interact with Revit because....isnt Revit simply a database with parametric geometry? Dynamo is a stand alone program but it could be used as an "add-on" to Revit. 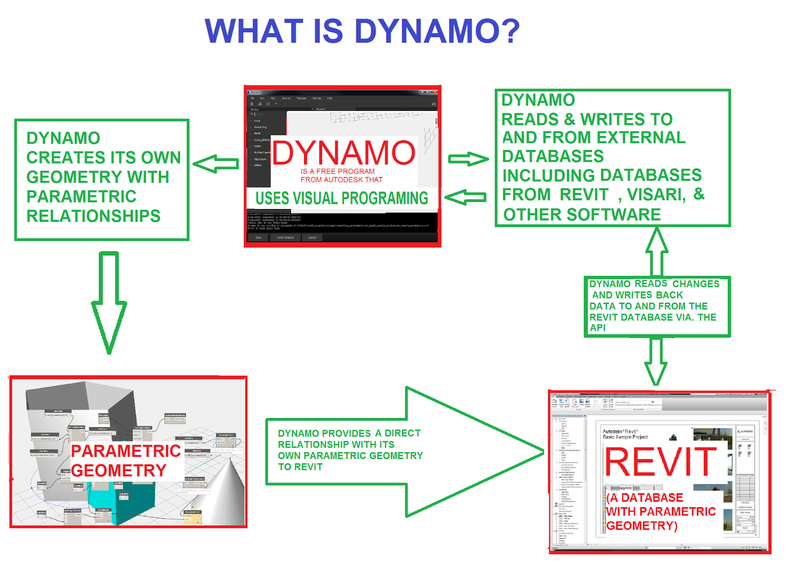 Dynamo reads and writes back data to and from the Revit database via the Revit api. The data could be just about anything, parameter values, family geometry, family placement. Basically Dynamo manipulates the Revit database in ways that the UI (user interface) could not. For example in Dynamo you could set the base of all the walls and all the columns to the same elevation. This means that you could set parameters from different families equal to eachother. Would that be helpful? Dynamo also provides a direct relationship between its OWN geometry and Revit. For example in Dynamo you could model a cone and a plane, find the intersection of those elements (that results in a curve) and then assign a Structural Revit Beam IN REVIT to that Dynamo curve and they would be forever "linked" meaning if the dynamo curve changed location then the Revit Beam would change location as well. All the while the original cone, plane, and curve would REMAIN in the dynamo program while the Structural Beam would remain in Revit. The applications for Dynamo and Revit are endless. Just about any Revit user could learn Dynamo (since it uses visual programming it is very simple to learn) they could access the Revit api and perform simple tasks that only could have previously been performed with writing an add-on or writing a macro with .net language for Revit. Oh and don't forget that Dynamo is completely free and is updated constantly. If you need the latest build or more information then click here and get started. Stay tuned for the next post on some tips on how to use the Dynamo Program.